Tunisian crochet, also commonly known as afghan stitch, can create an interesting textured fabric that is not normally possible through regular crochet, including stitches that look like knitted fabric. The basic difference between the two is that Tunisian crochet moves from right to left across the fabric, working each stitch onto the hook until all stitches have been added, then working each stitch off of the hook from left to right across the fabric. Also, when working a flat project, such as a scarf, the work is not turned in Tunisian crochet—the right side always faces up. Tunisian crochet is great for someone who has some experience with crochet and feels comfortable with foundation chains, basic stitches, increasing and decreasing. 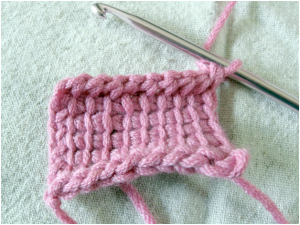 If you are brand new to crochet, you should familiarize yourself with these basics before learning Tunisian crochet. 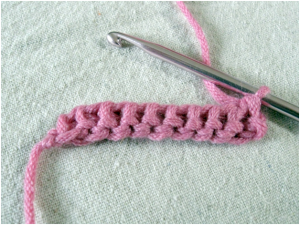 You can start here at our Introduction to Beginner Crochet. 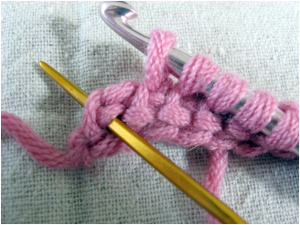 As Tunisian crochet requires holding a number of stitches on the hook at the same time, a special hook is needed. You can purchase a Tunisian hook or afghan hook at hobby and craft stores, yarn shops and on the Internet. Two types of hook are available: a very long hook (usually metal) and a shorter hook with a plastic cable extension and a stopper on the end (metal or wooden). Additionally, a pattern may call for a double-ended hook, called a cro-hook (each end has a hook). 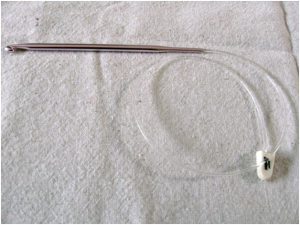 The photo below shows an example of the shorter hook with a plastic cable and stopper at the end. To begin, choose a hook size appropriate for the yarn you plan to work with. For example, if you have a worsted weight yarn, you would likely select an H hook (size 8), which is 5 mm. You can check the label on the ball of yarn for a hook size recommendation (see Introduction to Beginner Crochet for an example). Start the foundation chain by chaining any number of stitches you like, or if you are working from a pattern, chain the number specified in the instructions. I am going to use 10 chains in my example. 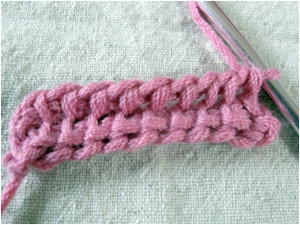 As with regular crochet, you can either work your stitches in the back bumps of your foundation chain or you can insert your crochet hook under the front and back loop. Photos will show working into the front and back loops. 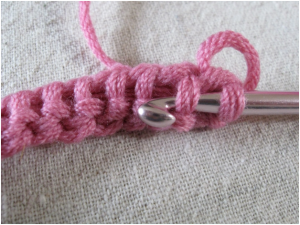 To work your first single crochet stitch, insert your hook into the second chain from the hook. The photo below shows where you will insert your hook. Yarn over and pull through that stitch. You will have two loops on your hook. 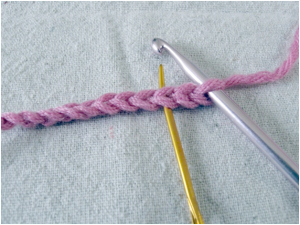 Continue by inserting the hook under the loops of the next chain, yarning over and pulling through the stitches. Repeat all across the foundation chain. At the end, you will have the same number of loops on your hook as the number of chains in the foundation chain (10 in the example). Yarn over and pull through one loop. You will still have the same number of loops on hook (10 in the example). Repeat step two (yarn over, pull through two loops) across until one loop remains on the hook. Row one is complete! Insert hook from right to left in the vertical bar second from the hook (not the vertical bar directly below the hook). Second vertical bar from the hook—first stitch is made here. 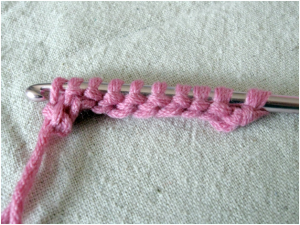 Yarn over and pull through the stitch (the vertical bar). Two loops are on the hook. 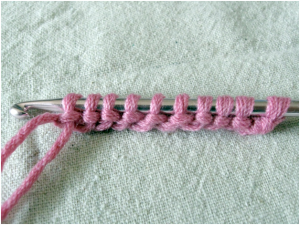 Insert hook under the next vertical bar, yarn over and pull through the hook. Continue across until the last vertical bar. This next step is done to add stability to the left edge: Find the horizontal bar directly to the right of the last vertical bar. (If you cannot find it, don’t worry—adding the horizontal bar is optional.) Insert hook under both stitches. Yarn over and pull through those two stitches. You should now have the same number of loops on your hook as your original foundation chain. Needle indicates the horizontal bar (lowest on the needle) and the last vertical bar (highest on the needle). Yarn over and pull through one loop. (original number of loops still on hook) Yarn over and pull through two loops on hook. (one loop less on the hook) Repeat across until one loop remains on the hook. Row two is complete. Row two forward and return pass completed. Repeat the forward and return pass on each row until your project reaches the desired length. Crochet fabric after several rows have been worked. There is more than one possible way to bind off; however, this particular bind off gives a nice edge to the fabric and is very simple. Crochet fabric after top edge has been bound off. You’ll notice that the fabric created by Tunisian crochet has a tendency to curl. Be sure to pin and block your project after it is finished to ensure that it will lay flat. 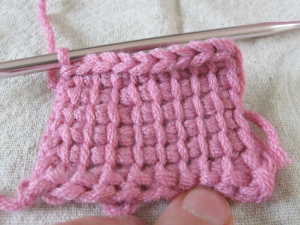 Try these Easy Afghan Stitch Potholders for a simple and fast first project. Search www.ravelry.com for free Tunisian crochet patterns.